Many people have opinions that social media is a tool of the enemy, so they avoid it like a plague. I have come to believe that Satan has no creative abilities, only those that may corrupt, pollute or distort something beautiful that God created, because I believe God is the almighty Creator- and that all things were created BY God and FOR God (Colossians 1:16). No one person can ‘create’ something totally by scratch. They can use the creative abilities bestowed upon them and inspired by God. However, in order to do so, they are using ingredients or supplies or materials…already created by the Creator. It is humanly impossible to create something that never before existed, using a substance that they alone created, out of nothing. Only a Creator can do this, and only God is the true, one and only, Creator. For something to be made, reproduced, invented, etc, something had to already previously existed or be created- then, using the creativity one possesses, an individual could potentially assemble something unique… using materials already created by the Creator. Everything has potential to be used for the good, or to be used for bad. We choose to use social media for either good, or bad. We can promote good (God) in all we do and say, or we can promote bad (Satan) in what we do and say. I think you understand my point. This morning, I read a post on Facebook from a friend. This friend suffered a tragic, sudden, unexpected loss of her beautiful, young, carefree, talented, full of life, full of God, daughter, 7 months ago. We lost our youngest daughter in a tragic, sudden, unexpected bizarre hurricane related accident 6 years ago next month from severe brain injuries when a tree fell on our van, but only for 6 minutes…somehow, supernaturally, God restored life and healing to our daughter…, whereas for my friend- her daughter’s death was sudden, complete- yet her daughter is complete, healed, restored, and alive as well, only living in Heaven. 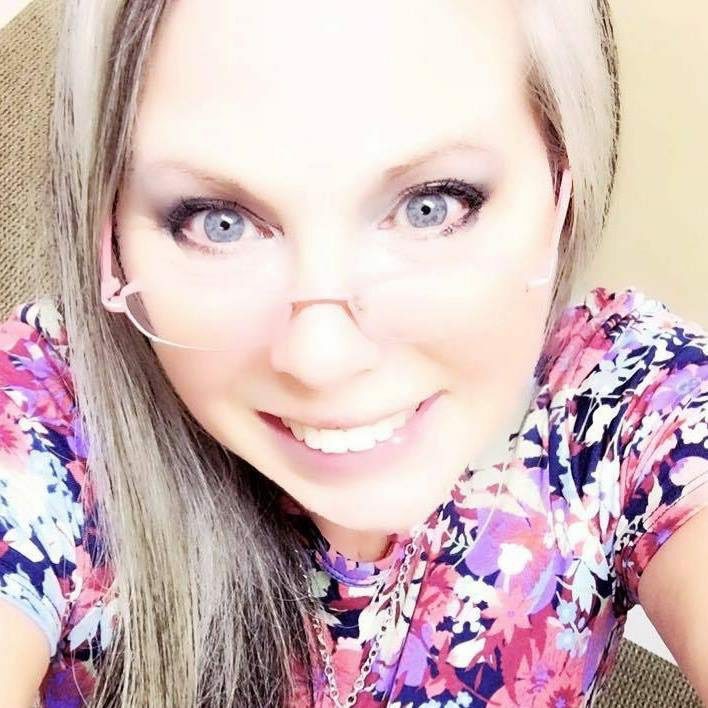 So I can relate, to a degree, of the emotions a parent feels seeing their own child lifeless…& my heart still aches for my friend… Sonya… and for all of her family who each one is still affected by the shock, still grieving from the unexpected, so I am still covering them in prayers for God’s supernatural comfort. I’ve since googled this poem. I wanted to read the whole poem, and to learn who penned it. It’s called ‘After a While’ by Veronica A Shoffstall. Simple. Yet profound. Healing balm to a wounded soul. And in doing so, discovered the rest of the poem. 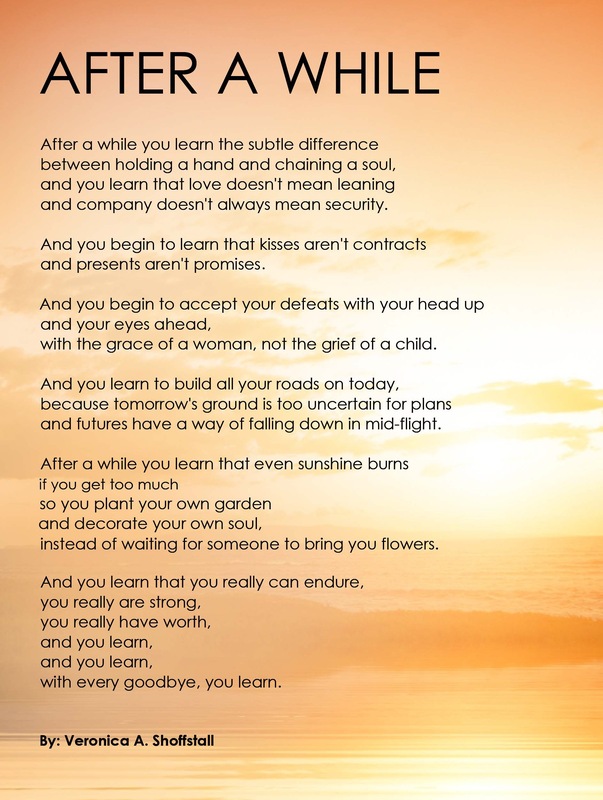 It’s called “After a While You Learn” and actually is part of the authors wordpress blog, copied below in the link. I encourage all to read, as it’s beautifully written and contains more gems of wisdom. Here’s a link to do just that, if you’d like. Through Facebook, a Pinterest ‘like’ temporarily connected a departed daughter, now living in Heavens eternity, with a grieving mother, still passing through life’s journey here on earth, in a beautiful God moment. All because of social media. Something God created to be used for good, not evil. It’s up to us to choose how. Today, I choose for good.